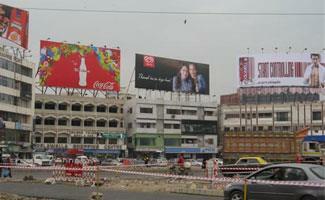 KMC Administrator Karachi Shoaib Ahmed Siddiqui said the campaign of removal of illegal hoardings in the city was underway and will continue till the removal of all such boards. He also directed that the removal of illegal hoardings be speed up further. Inspecting the removal of illegal hoardings at Karsaz Road and near Hassan Square he instructed local taxes department to remove all those advertisements for which the concerned parties have not paid the advertisement fee. He said no illegal or unlawful practice will be tolerated in the city. He also directed all KMC departments to ensure performing their duties in accordance to the rules and regulations.